Optimizing your resume to beat the Application Tracking System (ATS) software is extremely important. Let me tell you why? If you feel that the first obstacle to getting a job is a recruiter’s judgment on your resume, then you are following a myth. 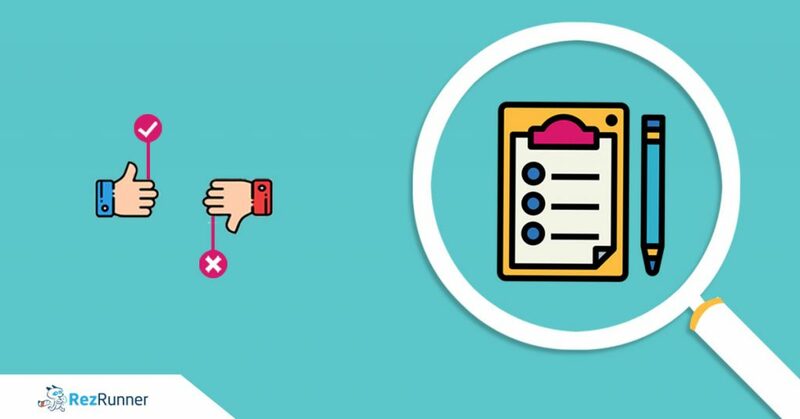 98% of the big organizations and a growing number of small and mid-sized businesses usually filter the resumes through an Applicant Tracking System (ATS) before the recruiter takes a look. After the resumes get filtered, it is seen by the human decision makers who schedule the job interviews. So if you want your resumes to get into the human hands you have to optimize your resume for the ATS. What is Applicant Tracking System (ATS)? Applicant Tracking system (ATS) is a software that is used by companies in recruitment process. ATS is used for several purposes including resume screening. To know more details about how ATS works you may read this article. Applicant Tracking System (ATS): What Job Applicant Needs To Know? You may take a sample tour with a sample resume and job description to see the process of optimizing your resume. Alternatively, you may check your own resume against job description to see if it is optimized or not. There is no magic trick to beat this Applicant Tracking System. However, a well-written resume that is mindful of ATS algorithm can get you that interview that you need. But how to create one? 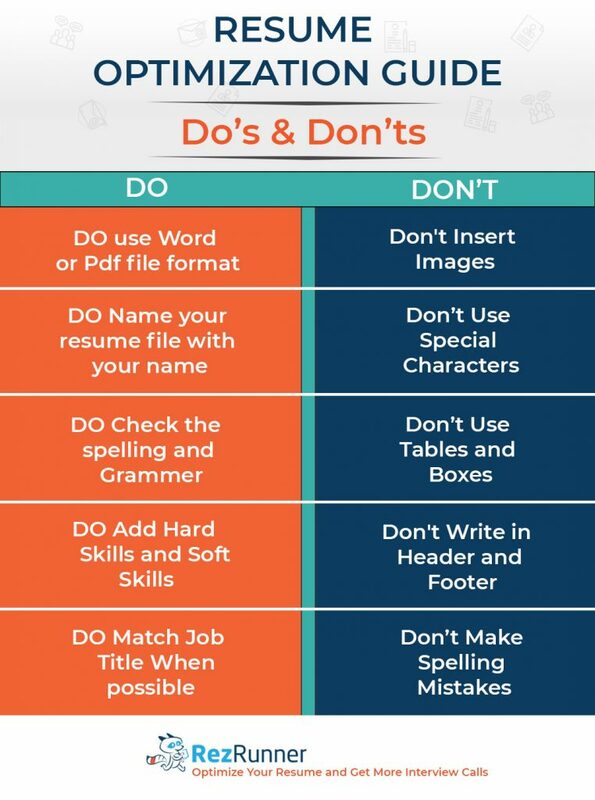 While you decide to create your ATS-friendly resume, primarily focus on the content (text and sentences) that you are framing. The content should be aligned with the ATS algorithm readable formats. Let us first discuss on formats and other details, and later shall discuss on content aspects. ATS does not accept all kind of file format. Your resume file should be in a standard form that is required. Either it will be in Word doc. Or pdf file. You should read the instructions carefully written over there and then try to upload your file. ATS tracking is a robot and thus it cannot read the images that you have inserted. So try avoiding the images and other graphic visuals. We often use this kind of options to demonstrate our data more accurately and support the facts. But remember the bots do not analyze these special figures. They can just read the text written in your resume. When we give our resume to these bots, they usually assemble them according to the keywords we have used. That is the reason it is always asked to use relevant keywords so that your resume gets selected by ATS and also ranked better. But if you will make a simple error like spelling mistake and grammar errors, ATS will miss keyword that could be important. Being grammatically correct is important if not for ATS but for next level human screening. You can highlight the text by changing the fonts to BOLD or capitalizing it. This would add extra emphasis and will attract the attention of the readers. If you have to write several points under one heading, you can systematize the content by adding standard bullet points. Don’t go fancy; use simple “dot” bullets. Do not use tick marks or images etc. There are certain professional fonts that give a standardized look to your content. Choose the right font for your resume. Some of the suggestions are Arial, Times New Roman, and Calibri. Coloring the text is appreciated. You can even highlight the text by changing the color of the text to any of your favorite colors. But remember that it stays a professional resume. However, from ATS point of view color is irrelevant. Now that we discussed on formats, we shall go over the content aspects. You might find it strange, but it is absolutely realistic, there is no universal resume (one resume) that fits appropriate for all the job descriptions. Two job descriptions and keywords mentioned can be different even if the title is the same. Therefore, it is advised to tailor your resume for the specific job application. And including keywords from job description to get more interview calls. Yes , keyword is the king. You can mention important keywords (hard skills and soft skills) by creating a sub heading and writing them all there. This not only helps ATS ranking, but also the hiring manager or recruiter can quickly see your skills on resume. Along with that you should also weave your keywords into sentences under experience part of your resume. This is because; some ATS gives more wait for the skills under experience, compared to skills under skills sub section. You need to focus primarily on two things, considering the presence of keywords (Key skills, Business Knowledge related terms in the job description) and the frequency (number of times these key skills/words are present in the job description because it indicates how important that keyword is)required while resume writing. Yes, the keyword is the king. You can mention important keywords (hard skills and soft skills) by creating a subheading and writing them all there. This not only helps ATS ranking, but also the hiring manager or recruiter can quickly see your skills on a resume. Along with that, you should also weave your keywords into sentences under experience part of your resume. This is because; some ATS gives more wait for the skills under experience, compared to skills under skills subsection. Consider using the keywords that match exactly the ones mentioned in the job description. You may incorporate each of the words in a separate sentence, but make sure you try to do an exact match for each important keyword. This helps in optimizing resume to beat ATS screening. – Responsible for accounts planning on a monthly basis. – Organizing data for internal and external reporting. – Creating process and procedures for routine activities. Where ever possible, Job Title match and education requirements match also improves your chances. If your current job says, “CustomerService Manager” but the job description is for “Customer Care Manager”, use only “Customer Care Manager”. You may mention job title in a resume like below, to make sure you don’t miss out due to this miss match. Do this only if you believe the role is similar but just the title is little different. Let me give one more example- “Data Scientist” job description from a company could be more about writing algorithms for analyzing data using open source and the tools used could be Python or R Programming. The same Data Scientist title for another company could be doing more of image processing and could use tools such as Keras or Tensor Flow. Even the job title is the same but the skills are different. This suggests that it is better to analyze the job description thoroughly before you write your resume. This is the same for B.Tech, BE, Bachelor of Technology. Make your decision wisely. Though ATS recognizes the difference, some don’t. So exact match is your best bet. 3) Tips on optimizing your resume with no job experience. When you are an applicant with lesser or no job experience than you will possibly apply for jobs that require little experience. In that case you have to be very conscious about the hard skills and soft skills that you are going to mention. The reason is- these skills are going to be the ‘key part’ here to optimize your resume. However, tips mentioned in Point 1. “Create an ATS-friendly resume” are common for all irrespective of fresher or experienced. You have to come up with a resume that passes the ATS resume scanner to optimize your resume. Moreover, if you feel that you are not a match for the job, don’t try to trick the ATS software by adding skills that you do not have. Apply only for jobs which you are qualified for. After all your ultimate goal is to get the job and do well in the job, getting an interview is just the intermediate goal. If you are eager to get the specific job you should prepare yourself with the specific skills required early. This way you are good to get the job. The challenge comes in when it is about incorporating the right keywords, mentioning your hard skills and soft skills. Usually, fresher’s do not have any professional skills, however, you might have learned some skills in school or through some certification courses or training, you may add them. If not, it’s better you invest time in learning skills required for job and then adding them in your resume. 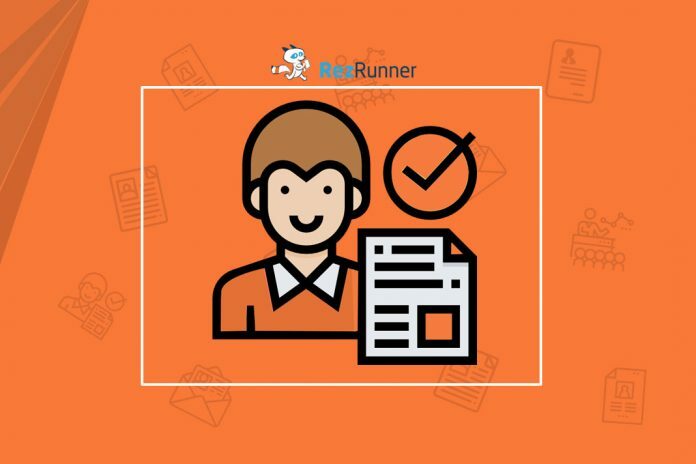 RezRunner is a resume optimization tool that helps you optimize your resume lets the resume get through the machine screening. It compares the skills required in the job description against the skills present in a resume. This way you know where you stand if you submit a resume as it is. This helps you to add necessary skills and keywords so that you can increase your chances of success to get interviews. Make the best use of RezRunner and get more interview calls. How to use resume keywords to get more interview calls.